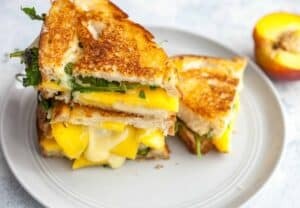 I was really itchin’ for a grilled cheese when I first came up with this sandwich, especially after my sort of failed grilled cheese, I needed inspiration from others. So I sent out a Tweet and figured I’d get some delicious ideas from the Tweople. I got some really great suggestions! @onmaggiesfarm maybe something sweet? like challah with ricotta or chevre honey and sliced peaches. @floridagirlindc ooh yeah- grill w peaches, arugula & gruyere! I wanted it immediately and this Peach Grilled Cheese sandwich was born. 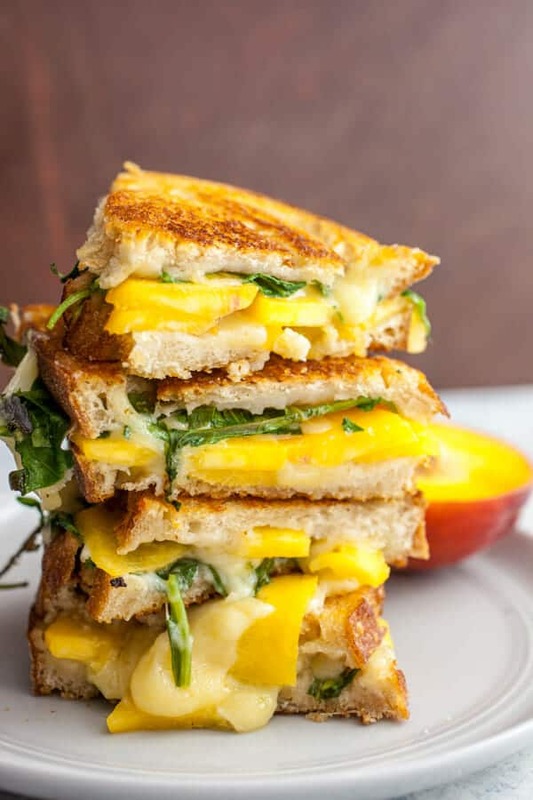 Grilled cheese using summer peaches, Gruyere cheese, and fresh arugula. A fantastic summer sandwich! 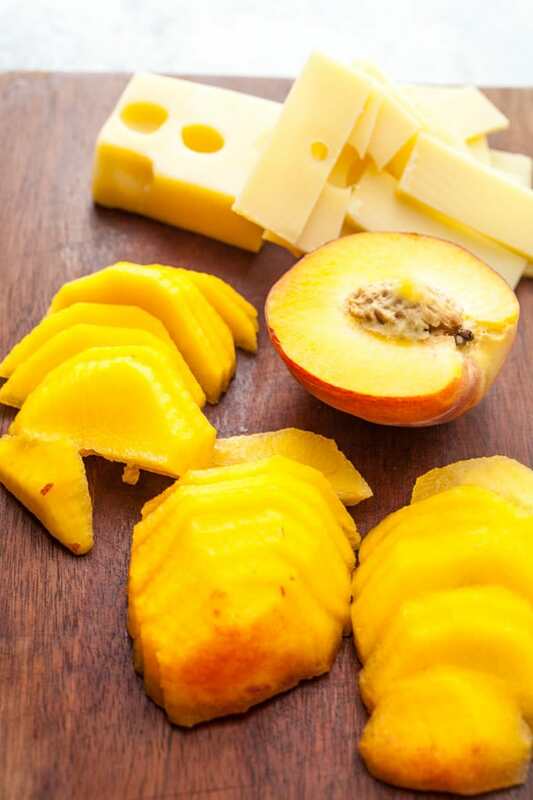 1) Peel and slice your peaches, slice the cheese, slice and lightly butter the bread. 2) Using a large skillet or non-stick pan, add a slice of bread, buttered side down for each sandwich. Put a layer of peaches and cheese on each slice. Top with arugula and the top piece of bread, buttered side up. 3) Cook over medium to medium-low heat, occasionally flipping until the bread is browned and the cheese is really melted. Gooey melted. Keep an eye on it to make sure the bread doesn’t burn. This will probably take 8-10 minutes. The flavors in this sandwich are kind of out of this world. There are only three ingredients, but they go perfectly together. You’ll also want some really sturdy bread for this sandwich. Wonder bread will not do the trick. Hunt out a good rustic loaf of bread or use some no knead bread if you have some. Peaches can be kind of tricky to peel because they’re a bit slippery. There are two techniques for this. First, you can brave them with a good veggie peeler or a paring knife. This is what I did and it works okay. You just need a steady hand. Second, you can dunk the guys in boiling water for a few seconds and then run them under cold water. The fuzzy peel should slide right off. Of course, for this technique you have to boil some water which adds on to your time. Also, this method doesn’t work as well unless your peaches are super ripe. Either method will work though. In any event, get all your ingredients ready before you start making the sandwich. That means slice the peaches, slice the cheese, and lightly butter one side of every slice of bread. You can cook a grilled cheese in almost anything (or even on a grill). I’ve done it in a normal skillet, a cast iron skillet, and a non-stick pan. I used a large non-stick pan for this sandwich. The key, in my opinion, to a good grilled cheese sandwich is to use medium to medium-low heat. If you crank up the heat too high, then the bread will be completely burned before the cheese is melted. 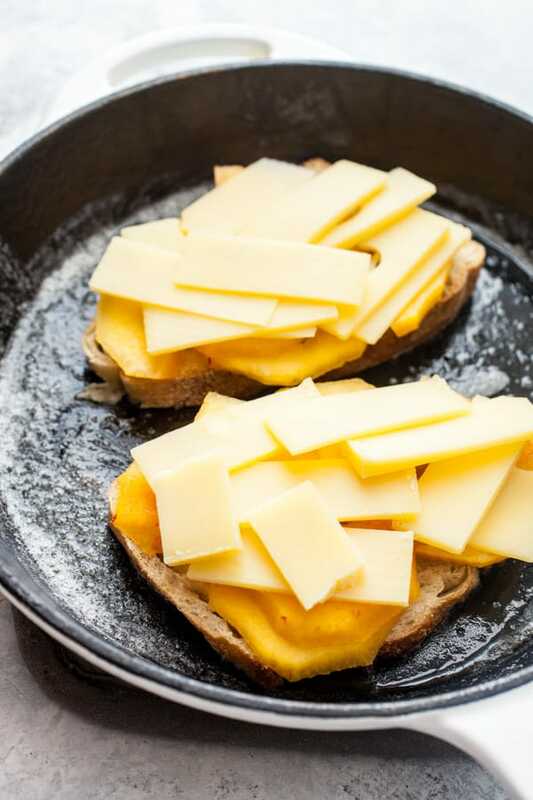 A low heat allows time for the heat to transfer through the bread and melt the cheese. I started by putting my pan over medium heat and then added two slices of bread, the peaches, and then the cheese. Just kind of layer it so it looks nice and even. Heavy on the peaches and cheese. Then add a handful of arugula and the top piece of bread, butter side up. Keep a close eye on your sandwich. Baby it. It’s probably the most important thing you’ll cook all day. After a few minutes, give the sandwich a flip with a big spatula. The sandwich will be sturdier as the cheese melts, but this first flip might be a little tricky. You might need to use your extra hand to hold the sandwich together as you flip it. If things slide around a bit, you can fix it after the flip. These sandwiches will probably take anywhere from 8-10 minutes to cook. Again, don’t get in a hurry. If you’re bread is browning too much on one side, flip it over to give that side a rest and turn down the heat a bit. As with any grilled cheese, the sandwich is done when the cheese is gooey! I used to rate grilled cheese sandwiches I made, so these were my ratings for this beauty! Cheesiness: 9. Melted Gruyere is one of my favorite cheeses. Sure it’s a bit expensive, but it’s really delicious and melts perfectly. Bread: 9. Sourdough is a great grilled cheese bread. It easily held up to the fillings and browned nicely. Fillings: 9. Perfect. Summer. Fillings. Overall: 9. This was one of the best grilled cheeses I’ve made. As good if not slightly better than the Brie and Pesto Sandwich. 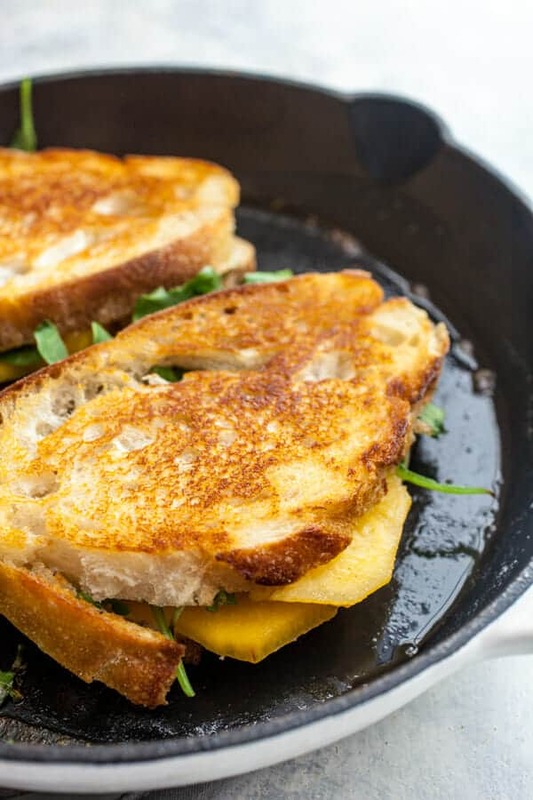 If you can get your hands on some good peaches, this Peach Grilled Cheese a solid use for them! I have been addicted to a variety of grilled cheese sammies lately. I can't wait to try this one! Sounds awesome. Thanks for the link! I am really giving my panini press a workout lately. LOL We will have to try this. nice! this is a way to get my hubby to eat his fruits–inside a grilled cheese. brillant. I recently made a caprese grilled cheese, but instead of bread I used fried eggplant. You should try it! I've been looking for a creative way of using the peaches we keep getting in our CSA and this is probably it! I always have gruyere in the fridge because I'm quite a big fan also! You were smart to avoid my suggestion. Peaches FTW. While this looks good, I think I may try @onmaggiesfarm suggestion! Wow! That looks amazing. What a perfect summer lunch! Nice sandwich Nick! I find something that may help you though, try grating your cheese for the grilled cheese. You will never go back to slices again! Good call. Generally makes for easier melting. I'm just lazy and had a dirty knife and a clean grater and didn't want to mess that situation up. That's a combination I probably wouldn't have thought of but it makes total sense, and sounds amazing. It'll be the next sandwich I make. Thanks! This recipe fits my definition of a grilled cheese sandwich but so different at the same time! This one would certainly be popular in my house! Great to see a new spin on an old favorite. Oh yum, this sounds delicious. If you had used a ridged griddle pan it would have looked like a panani. I'll have to try this one, thanks. Love the idea of the peaches in the sammy. I bet this would be awesome with some mozzarella and basil, too. Hint: if you want to get peach skins off super-easily, score an "x" at the bottom with a sharp knife, impale peach on a long-handled fork and dunk in boiling water for about 15 seconds. By the time the second one is dunked, the first one is cool enough to handle. Works like a dream for tomatoes and nectarines as well. this is my new favorite sandwich. I added basil because I had some in the fridge… and I've eaten this sandwich 3 times now since this post. amazing. I just eat this sandwich and it was delicious … thanks for the recipe! I remember when I was kid, I would eat grilled cheese sandwiches at least 3 times a week! Haha! Thanks for sharing your recipe! It looks delicious. Now, I’m all about this Italian Grilled Cheese and Tomato – http://www.recipe4living.com/recipes/italian_grilled_cheese_and_tomato.htm – Hope you enjoy it too! I’ve recently launched my own blog, I’d love for you to check it out and let me know what you think! :) http://www.prettygoodfood.com Thanks and Happy Cooking! I love grilled cheese with pesto, and/or thinly sliced pear… yum! Can’t wait to try it with peaches. Great idea!